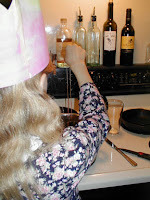 Last week at our bi-monthly coop we learned how to tap maple trees, collect sap, and cook it down into maple syrup. Sunburst and I have been intrigued by this idea for years, and wow! It turns out that it's a fairly simple process. Since we live in the city we had to opt for a legal outdoor heat source like propane. According to the literature, it takes anywhere from 32 -50 gallons of sap to make ONE gallon of syrup, depending on the kind of maple tree you tap and the sugar content of your sap. 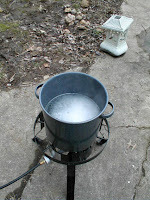 That's a lot of water to cook out, so you boil sap for several hours every day during maple season. 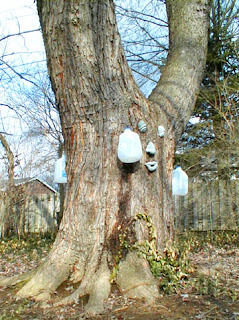 We have seven taps running right now on three maple trees, and that gives us about 3 gallons of sap per day. That's as much as will fit in my pot, leaving the tiniest bit of room in hopes that it doesn't boil over. A two-day accumulation of boiled sap gives me just one pint of syrup. It doesn't sound like much, does it? But that one little bit of syrup makes my heart sing! I don't think I've been this excited about anything in a long time! There is a wealth of information out there on tapping trees in your own backyard. I can't recommend it enough! If you try this at home, please remember to thank your trees! 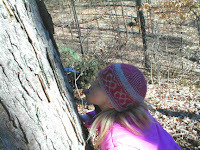 Be sure to check out Aleisha's great photos of our co-op tree-tapping event. STOP telling your kids they're smart! Apparently, telling your kids they're smart sets them up to be underachieving failures. Fascinating! We've been having a blast lately making up words. This is Sunburst's own Word Family Village. It's not finished yet, but she has been working on it steadily, and with great gusto, for the last three weeks. 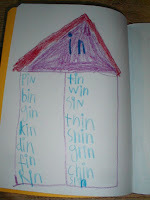 And not only is it fun, it's accomplishing exactly what I had hoped that it would: Sunburst is learning to spell. As any unschooler will tell you, the best way to learn to spell is by reading. That argument makes perfect sense to me. But for some reason, despite the fact that Sunburst readily and greedily reads over 200 pages a day now, she still can't spell. Maybe this is something that comes with time? Or maybe, I think, Sunburst has always been a FAST sort of person. Despite her reading ability and comprehension, she doesn't slow down to think about how words are constructed. So when it comes time for her to write words, they fumble upon the page in strange configurations. So I thought we'd slow things down a bit and work on basic word construction. Word Families. You know what I'm talking about - -it, -in, -an, -on, -up, -un, -en, -et.... that sort of thing. Once upon a time there was a family called the In Family. 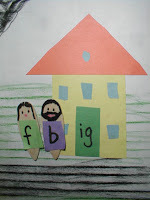 They lived in a very small house with a red door that that had their name written right upon it: In. That way the mail carrier never got confused and delivered them someone else's mail. Well, one day, even though their house was small, they decided to have a big party. Their relatives started arriving in an orange bus. b, d, t, g, w... All of them came, and they were having a great time. They cooked up a mess of yummy food, and laughed, and hugged, and talked all day long . But as the night wore on, they got louder and louder and louder. No one at the In house could sleep with all this noise, so they decided to stay up all night long. They cooked more food, laughed at each other's jokes, and cranked up the music and had a dance party. It was great, except for one thing. The noise coming from the In house was so loud that it woke up the neighbors. One by one the neighbors came over and knocked on the door asking them to quiet down. Finally, the sheriff came, and that got their attention. "Shhhhhhhhh!" Said the sheriff, "Your neighbors are trying to sleep!" So one by one, the Ins settled down to a whisper, and as the sun started peeking over the horizon, the last In had fallen fast asleep. Then Sunburst asked for another story. 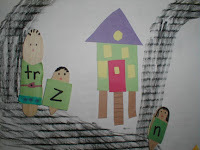 But first I handed her a pad of construction paper, scissors, and a glue stick and asked her to make the In house. While she was doing this, I took a few wooden shapes (spoons, popsicle sticks, and teardrops) and began to make consonant people. Sunburst helped dress them. The small ones are singular consonants. The larger ones are consonant blends. 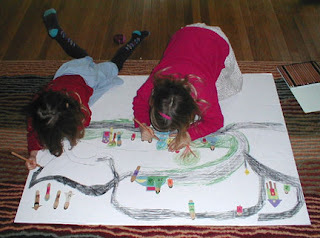 She took her In house and glued it onto a presentation board and started drawing roads and grass, and before we knew it, it started to look like a village. 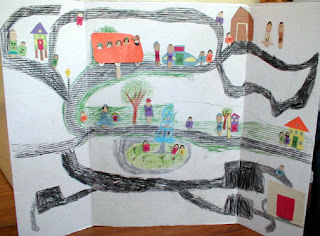 She even drew a town square with a fountain! 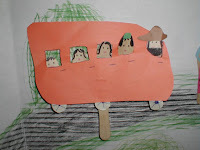 We attached the people with a loop of masking tape on the back, and one by one we started moving families in. The Ut house looks like a hut. The Up house is on stilts. The Ub house, well, it's actually an elitist pizza parlor. You have to make an -ub word to eat there... otherwise, they deliver. Sunburst even got Moonshine involved by having her color in all the roads. All this was well and fun, but the question was still there. Is Sunburst learning to spell? To answer that query, we decided to host a spelling bee. It was actually Sunburst's idea to have an oral test. Three of our favorite characters came: Martha, Charlotte, and Rosemary. Sunburst represented for each of them, of course. 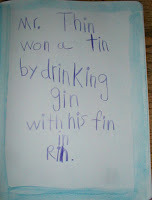 They all did an outstanding job spelling words from a few different families. And rumor has it, they can't wait to do it again. We had a bit of a freeze here. On Tuesday we lost our power around noon while I was cooking lunch. We kept waiting for it to come back on, anticipating that it wouldn't be out for long. But it didn't. All day long we watched the freezing rain come down. We huddled in front of the gas fireplace, boiled kettles of water for tea and spaghetti, and bit by bit started putting on extra sweaters, hats, scarves, gloves... and still the power didn't come back on. We urged the kids to run around in circles to keep warm. We snuggled and read by firelight and candlelight, until our eyes hurt and we finally gave up. It was dark. It was cold. And the kids, fully dressed, climbed into sleeping bags and went to sleep. Early. Very, very early. The cold woke us up earlier than usual. We couldn't boil water fast enough for tea. Outside, the world outside had turned into a blanket of ice. Inside the house, we could see our breath. We were all shivering and teeth chattering and heaped up together to stay warm. Or trying to stay warm. With coats on and everything, it was still ridiculously unbearable. Einstein and I weighed the thickness of the chill against the obviously treacherous icy roads, and it wasn't a hard choice. As we were herding the kids toward the open door it happened. In our moment of desperation the power came back on. Our rejoicing was great, to say the least. It's amazing how much we take for granted. Light at the end of a switch. Heat at the push of a button. Dry roads most of the year. I find I don't think about those things until they're not there. It inspired a lot of talk about the olden days, and how even our gas fireplace was a gift of modern technology. Twenty-two hours without electricity isn't much when you really think about all those who have gone before. We've been reading through the Little House series: Martha, Charlotte... Laura-- none of them had electricity. And yet they managed extremely well. Birthday week is finally over! Thanks for all the well wishes. 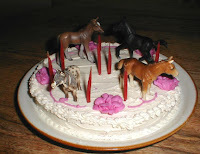 On Tuesday we had a little family celebration with a very small cake that was completely overwhelmed with plastic horses. Then on Saturday we filled our house with the laughter and shrieking of three lovely families and their children in what amassed in a five hour birthday party bonanza with even more cake. To say the least, Sunburst was thrilled! 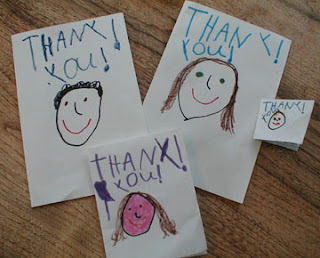 So thrilled in fact, that she made us a family of "Thank You" cards to commemorate the loveliness of her birthday. We inadvertently created a new birthday tradition in this house when I realized that I completely forgot to purchase birthday candles until the afternoon of Sunburst's birthday. Rather than brave the snow, we decided to melt a bit of beeswax in a small bean can and add in a bit of candle coloring wax. Sunburst was overjoyed to labor away dipping her own birthday candles, two at a time, on lengths of crochet cotton I cut for the task. They worked beautifully! And she managed to count and make enough to outfit her party cake as well. As for me, I kept busy teaching myself to make icing roses, per Sunburst's request. 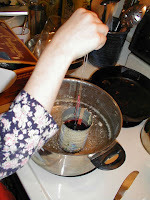 Luckily, I wasn't completely on my own in this, as I discovered that there are a slew of cake decorating videos online. At our bi-monthly co-op my favorite camp counselor, Aleisha, taught us some new songs and drama games that have kept the kids entertained for several days now. Even Kitty Bill is captivated by "Tony Chestnut," so it looks like we'll be adding it to our pre-lessons warm-up over here. I've noticed that, although we can't manage a full circle time each day, things go a lot smoother if we warm up a bit with a couple of movement songs and hand-clapping. Kitty Bill is no longer living up to the passivity of his blog name. He's a mischievous little sprite! He's into everything these days, including all the kitchen drawers and the kitchen counters. Nothing is safe. Nothing is sacred. He has even demolished our sturdy easel chalkboard. And naps? Forget about it. He says he's too old for that nonsense anymore. So a new name for him is in the works... and an all-new naptime scheme. In other news, I met with a new doctor on Friday who pronounced my heel to be suffering from nerve damage. It has been 12 weeks since our car accident, and I'm still limping along. Every time I try to put just a bit more weight on that heel my progress moves backwards. So how long is it going to take? The doctor told me that it could be another 3 months. I was so taken aback by this news that I didn't even know what to say to him. He can't be serious, right? Could it really take six months (or more?) until I can walk normally again? Until then, I continue with physical therapy. Though I'd much rather be pain-free, truth be told, there are worse ways to spend 45 minutes a week than getting a foot massage. I'll still be seven years old to-night. To-morrow I'll be eight years old. Eight candles on my cake! Sunburst has not been able to contain herself all day. Tomorrow she'll be turning eight. EIGHT!? It seems so old... how on earth did she get to be eight already?! May our hearts always be light. May we all be healthy fed. May Spring not be so far away. Today was a great day. We're really back in the flow, and boy, does it feel good. Yesterday Sunburst and I sat down and had a talk about how things are going. She's been lost in a reading zone lately-- just completely obsessed with two different series she's working through (The Fairy Realm and Rowan of Rin.) It has been really hard to capture her attention, and I get it. Who wants to put down a good book? Or in her case, a good pile of books? She hasn't seemed all that interested in anything I suggest lately, namely, our Waldorf lessons. So I asked her if she wanted to continue with them or not. She looked at me like I asked her if she wanted to eat a porcupine. Stop. Doing. Lessons? So we came up with a plan to fit in lessons AND reading time, and today's execution went off without a hitch. We got so much accomplished, both in work and play, that I just want to bronze this day and hang it on the wall. 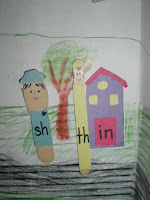 We even managed to sneak in some Saints work, recalling a story of St. Brigid's Cloak, that we read over the holidays. Plus a couple more St. Brigit stories from this site. We had a good mix of Groundhog's Day, Candelmas, and St. Brigid's Day revelry, and even whipped up an Irish soda bread in the shape of a cross for afternoon snack. Preheat oven to 350. Mix all dry ingredients. 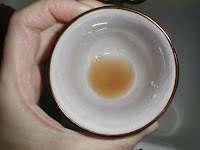 Add milk and vinegar and stir gently until mixed. 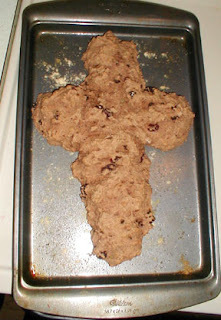 Spoon mixture onto a greased cookie sheet in the shape of a cross. Bake for about 30 minutes.